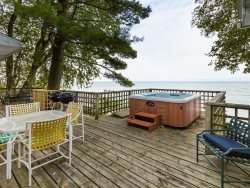 The vast deck seats many members of your group who will enjoy a front seat view of Lake Michigan with its beautiful sunsets and crashing waves. With open concept living and great space your family has plenty of room to enjoy time with one another. On one of those beautiful nights have a beach fire and relax under the stars. This rustic gated community, called Palisades Park, offers many special amenities. This area is just a short drive away from downtown South Haven, so you aren't far from all of the dining and shopping it has to offer! This home is not available from October 15 - April 15. Summer weekly rentals begin or end on Saturdays. Bedroom 1: Queen & Twin-Lower level - accessed from outside, no interior stairs. You will pass through 3 to get to 2 and through 2 to get to 4. Well satisfied talking with team members. Everyone was super friendly and the transaction was easy! We had an excellent trip and loved the property! We enjoyed our stay. have been coming to the park for years but first time at Vashmar. Comfortable and clean. Only concern was that the garbage had not been removed from the prior guests; the bins were completely full and we arrived the day of garbage pickup, after the trucks had gone through. didn't end up calling the service as I've learned from prior visits to the park that we would be required to drive the garbage up to the tennis court area dumpsters. we ended up using the bins on the path leading to the cottage by soda bar; not sure if they were for general use but was the best solution. The team was great- no issues there. The house badly needs maintenance. Lots of spiders in the downstairs bedroom/bath. It was somewhat awkward that all the bathrooms were only able to be accessed by going through bedrooms. A 1/2 bath in the common area would have been helpful. Dawn was an absolute delight to work with and very accommodating. We booked at the last moment when our other arrangements fell through, and Dawn was so helpful and accommodating. She called to tell us a repairman would be coming, and he, too, was very friendly. Shear delight! The house was VERY clean and well cared for. Only suggestions: lighting over the outside stairway, and a few lights in the house are burned out. Better signage to the house. Thank you! Dawn was wonderfully helpful and welcoming. We booked at the last moment when our other arrangements fell through. If all your staff are like Dawn you are in good stead. A service man came to service the hot tub. He, too, was very friendly and helpful. Our weekend stay at Vashmar was perfect. The house was very clean and well supplied. The setting was beautiful and we enjoyed the beautiful Lake Michigan sunsets every evening. Our campfire experience was wonderful! All in all, our weekend was a wonderful experience. One small suggestion: the directions to the house once we left the entrance gate were just a bit challenging. We had to ask a neighbor where Vashmar was located. The outside lighting over the stairway might be improved. Thank you for sharing this beautiful spot! Everyone we talked to were extremely helpful! Overall a wonderful experience, we look forward to working with you again!